I've taken this test before. I'm a strong libertarian on the civil-rights scale, and one little rectangle right of center on the economic scale. Notably, there are no politicians in my quadrant. I didn't complete the test this time because my true answer to about half the questions would have been "not applicable---the premise of the question is wrong." And that option wasn't available. I remember the others as not so blatant (in one way or another) - I have to figure out how to find them on search, as they were probably here before the tag system. Craven may have started one and Thomas might have - or I'm misremembering who might have started them. And I thought Craven did first. Glad to be wrong though. I just remember liking the concept. The newest version was 4 years old, don't you think it is time to go it again??? I agree it was a good idea. From Hingehead's list, I can see that my social libertarianism hasn't changed in the last 10 years, but that my economic libertarianism has eroded from +3.6 or so to +0.5 (I did complete the test now, just to check). This broadly agrees with the changing positions I've defended in A2K's political threads over time. I attribute the change to the experience of actually living under an economically-libertarian system, to the financial crisis of 2008, and to the Great Recession. I guess i am to the left of Ghandi. Does that make me a liberal. I too would have liked a no opinion option and many of the questions were slanted. But interesting. Somewhat left of Milton Friedman. A fine place to be. I gave up with the graph as well. 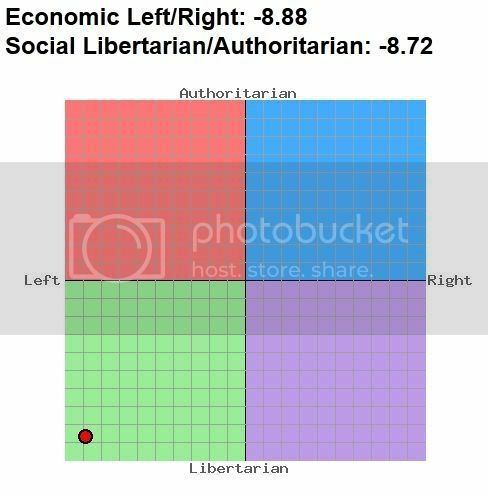 I got economic left/right -8 Social Libertarian/Authoritarian -5.23. Lower Left with most of us. No wonder I am so disgusted with the current political climate. Or this result doesn't fit your preconceived notions.